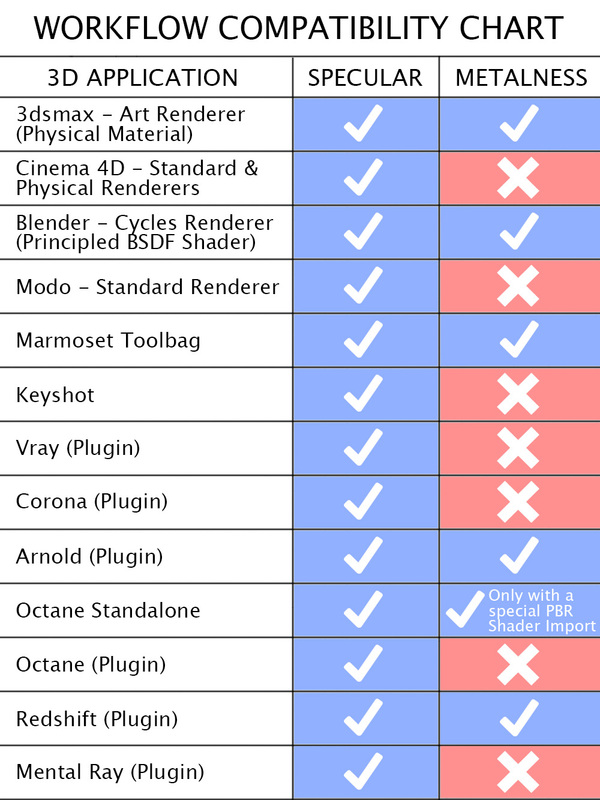 This is the industry standard which the majority of high-end 3d renderers utilize. Several examples include; Vray, Corona, Renderman, Arnold etc. A common confusion we have noticed from our users revolves around the color texture maps for metallic materials using the specular workflow. Lets take one of our materials as an example, Metal Stainless Steel Patterned Cross Hatched 001. You'll notice here, under the specular workflow version of this material that the color (COL) texture is completely black, this is normal as the color information for metallic material lies within the reflection map (REFL) instead when using this workflow. This workflow type is more appropriate for real-time PBR renderers such as the Unreal Engine, Unity, Quixel etc. However as the PBR workflow is becoming more and more popular, a number of traditional renderers are now adopting this workflow so that you can choose which you'd like to use. Usually this is represented by a "metalness" slider in the shader which lets you effectively switch between these workflows. As you can see, the specular workflow works in all of these applications, whereas only a few support the metalness workflow. So stick to the specular workflow if you are in doubt.